I must be a masochist. I gripe about spending too much money at restaurants that hardly live up to their price tags in quality or service, while I reserve restaurants that are worth the extra buck for the occasional celebratory meal. I suppose the torment makes those few special experiences that much tastier. Mr. Green Bean and I have now commemorated two wedding anniversaries at Blue Duck Tavern in the Park Hyatt Washington. This West End establishment has been an award winning beacon since its opening in 2006. Executive Chef Sebastien Archambault and Chef de Cuisine John Melfi create refined American food using traditional cooking methods and fresh local ingredients. The restaurant’s sleek, clean design and bright, airy atmosphere is sophisticated, yet casual and comfortable. An open kitchen and bakery energize the space and titillate the palette. Add to all of that their friendly and informative staff and Blue Duck Tavern qualifies as a triple-threat, excelling in the arenas of food, atmosphere, and service. The Blue Duck Tavern menu is divided into starters, entrées and sides and sub-categorized by vegetables, seafood, poultry and meat. Though the menu changes seasonally, our servers on both occasions were able to confidently highlight the many gluten-free offerings. Mr. GB and I both grinned when the server on our first visit confirmed that the Hand Cut BDT Triple Fries are fried in gluten-free duck fat. We placed an order before she even finished her sentence. 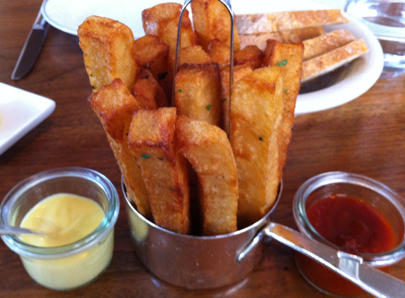 These massive potato sticks served piping hot with homemade aioli and ketchup are a must. 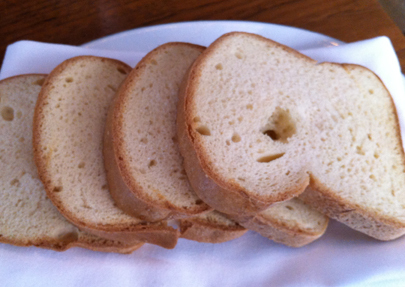 On our more recent visit last month, I informed our server of my gluten “allergy”, and he appeared soon after with several slices of gluten-free bread. I could have toasted better Udi’s at home, but the gesture was thoughtful. We snacked on our much anticipated order of BDT Fries (just as amazing as I had remembered), while I struggled to make a decision on my main course. I had the seared scallops last year and, though the preparation had changed, was tempted to order them again. 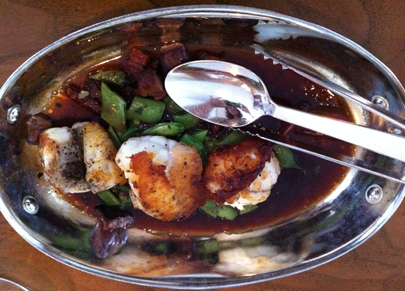 I opted instead for the market fish of the day, a monkfish with a red wine jus, bacon and foie gras bits, and a green bean salad (yes, I promised Mr. GB he could have some veggies). A fleet of hands cleared our appetizer plates (they didn’t dare remove the last remaining fries from my watchful eye), and reset the silverware for our main courses. Monkfish, also known as the sea-devil, is one scary looking species with a body that’s mostly mouth. The meat of the fish comes from its tail and has a lobster-like toughness. Blue Duck Tavern prepared the ugly creature beautifully. Large pieces of meat were seared golden. 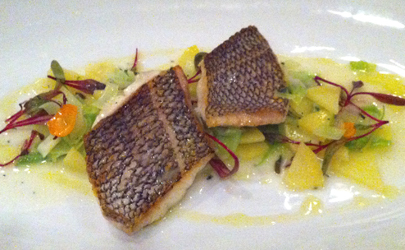 The mild fish was complimented by the bold flavors of the jus, foie gras and bacon. Slices of crunchy bean pods added texture and respite from the other rich accompaniments. Though portions are sizable, the many intriguing menu items make it impossible to resist add-ons. 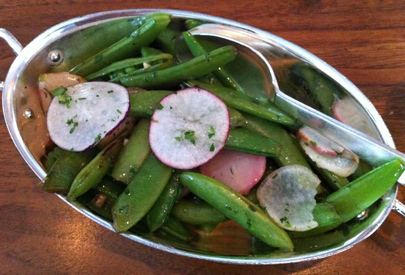 We tried the side of sugar snap peas with radishes, farm butter and herbs. 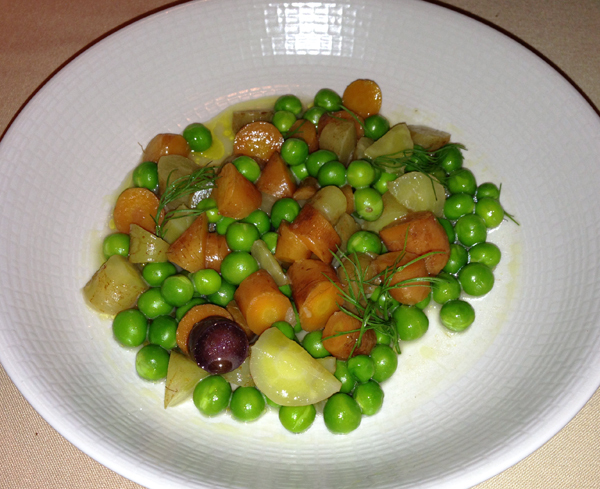 The brilliant red skin and white flesh of the radishes accented the bright green shells and cut the peas’ sweetness with a slightly bitter crunch. 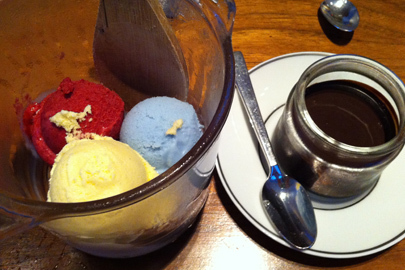 Blue Duck Tavern is known for their incredible desserts. The flaky pastry crusts are difficult to ignore en route to the bathroom through the dolce kitchen. But a main feature of the menu is the selection of gluten-free, homemade ice creams and sorbets with chocolate, caramel or raspberry toppings a la carte. Having experienced the ice cream and caramel sauce on our first visit, Mr. GB and I determined to skip dessert this time around. Then our server arrived with the dessert menus and two glasses of a sweet, sparkling red wine in honor of our anniversary (one year prior we were served two glasses of bubbly upon our arrival). How could we say no to dessert now! 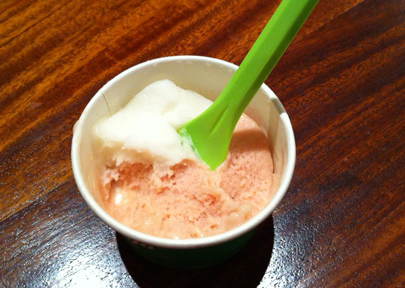 We succumbed to scoops of the honey vanilla ice cream, candied violet frozen yogurt, and cherry blossom sorbet. Our server surprised us with a jar of the chocolate sauce, with his personal congratulations. How could I have skipped this chocolate, I thought as I began bypassing the frozen treats and spooning dark brown gooey heaven into my mouth. Very few restaurants can truly make an occasion feel special. 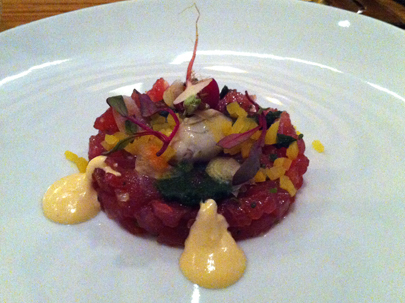 I hand it to BDT for not merely relaying on outstanding food in a stunningly designed space. The attentive and gracious service sets Blue Duck Tavern apart, making any diner’s experience worth the price tag. 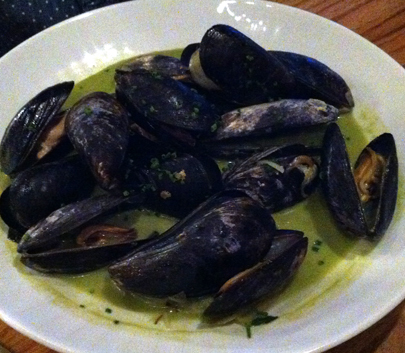 Categories: 5 Spoons, American, Comfort, Dinner, Gluten-Free, Local, Seafood, Seasonal, Washington DC | Permalink. Chef and restauranteur Robert Weidmaier is a family man. He named his first restaurant, the highly acclaimed Marcel’s, after his first-born and the ever-popular Brasserie Beck after his second son. His restaurant progeny is treated with the same diplomatic paternalism. 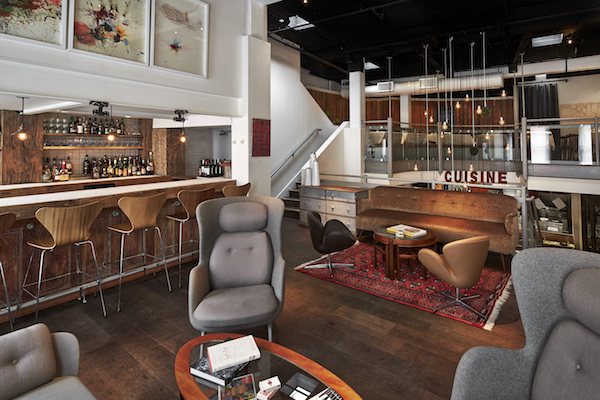 Over the past 14 years, Weidmaier has indiscriminately set roots in Washington DC (the above mentioned restaurants), Alexandria, VA (Brabo and Brabo Tasting Room), and Bethesda, MD (Mussel Bar & Grill, with a rebellious second location in Atlantic City). Six rocking establishments all serve up expertly executed cuisine inspired by Weidmaier’s German/French upbringing. 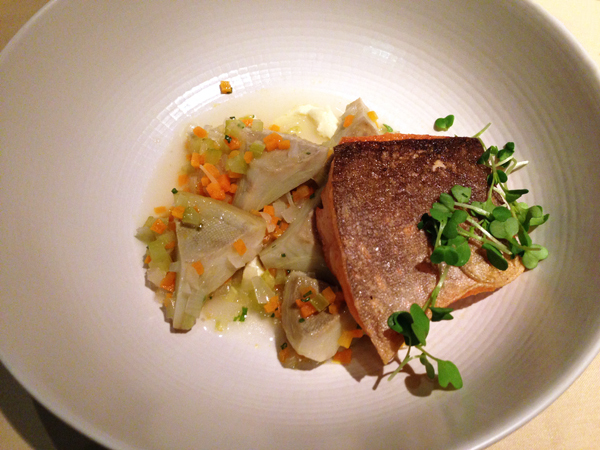 The chef’s latest creation, Wildwood Kitchen, exposes Weidmaier’s quieter side. The restaurant is a neighborhood gem, a casual go-to spot for well-to-do Bethesda dwellers, with a menu offering healthy Mediterranean inspired food, far lighter than Weidmaier’s typical fare. Dying to try the place, Mr. Green Bean and I dragged Ma and Pa Green Bean and Sister Seitan from all the fabulous dining options in DC, up the long stretch of Old Georgetown Road. The space, modestly tucked into the Shops at Wildwood in North Bethesda, is surprisingly bright and airy for its small size. High ceilings cut down on noise, a much appreciated feature for this slightly older crowd (I’m being kind). A “woodsy” theme abounds with exposed beams, natural wood tables and a trim of wallpaper featuring a glowing forest of plush trees. We were seated and soon greeted by our server sporting a custom-made plaid button-down uniform. The menu is small, yet offers a wide variety of appetizers and entrées featuring fresh seasonal vegetables, seafood, and white and red meats. 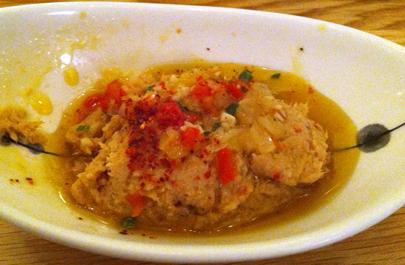 As we looked over our options, we were served a basket of crusty french bread with a side of fresh tuna salad in a bowl of olive oil, sprinkled with fresh peppers and spices. While my table mates reached for the gluten, I was the only one enjoying the far more noteworthy condiment (which I’m sure would have tasted even grander spread on that bread). I started in with my waiter to size up Wildwood’s gluten-free consciousness. The restaurant proved to be one of my favorite types: predominantly gluten-free or happy to adapt with staff that is sincerely concerned but not alarmed by the allergy. At restaurants like this, there is no need for a gluten-free menu or gluten-free indicators, as the chef will make sure to customize whatever you’re craving. I decided to start with the gazpacho, a predictable summer starter that I usually refuse to order in protest of its unoriginality. 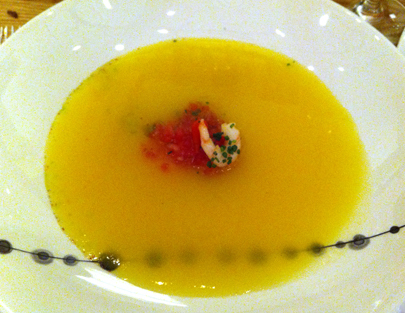 However, this one was unique with its yellow tomatoes pureed to a translucent broth, poured table-side over finely diced watermelon and one tiny shrimp packed with a salty ocean punch. The bowl was perfectly balanced between its acidic, salty and sweet components. For my main course, I opted for the night’s special: skin on fillet of trout, simply grilled with olive oil, salt, pepper, and lime. 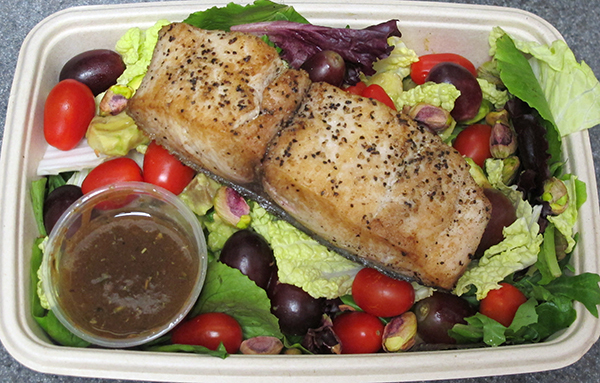 The fish was topped with roasted tomatoes, green Mexican chickpeas, olives, sesame seeds, and a light pesto vinaigrette. Trout itself is not the most spectacular of fishes. But it acts nicely as a neutral platform from which scrumptious sauces and toppings can be laid. 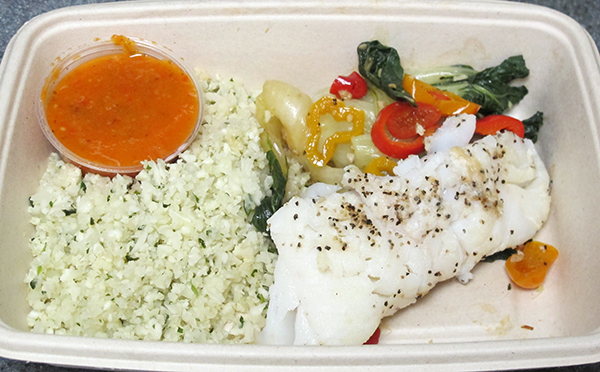 The dish was light, fresh, and perfectly portioned with a variety of textures and flavors. I actually felt healthier after cleaning my plate. To my dismay the other plates ordered at the table were off-limits for my wandering fork. 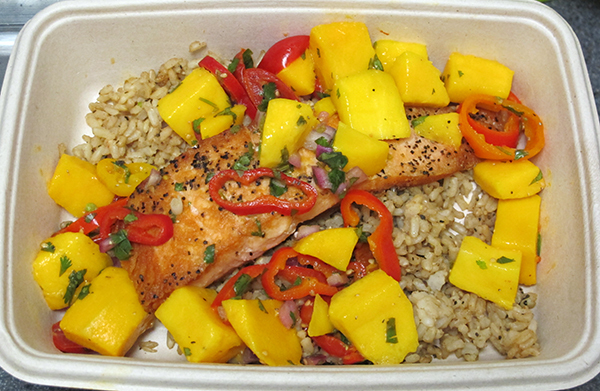 But the Pan-Seared Salmon, Grilled Farmhouse Chicken, and Braised Short Ribs all received fine marks. 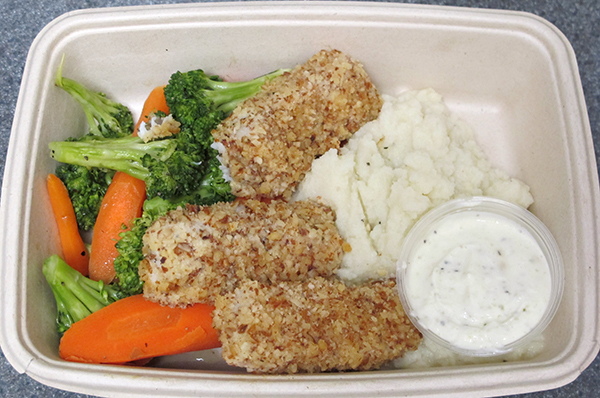 Sister Seitan had the chef cook up a vegetarian option, making sure it included something starchy (flashback to BlackSalt where the chef concocted a $28 plate of vegetables). She was pleased with her mystery dish, featuring her most favorite food group, pasta, and cashing in at an appropriate $18. With the menu as versatile and health conscious as it is, I’m baffled that Wildwood does not have a vegetarian item listed with its entrées. It’s amazingly true that being vegetarian is often more limiting than being gluten-free. The dessert menu is a bit disappointing for us gluties with only sorbet and ice cream as options. We decided to pass, or so we thought. As we were celebrating the occasions of Mr. Green Bean’s birthday and our wedding anniversary, the obligatory sweet treat was served, accompanied by our family’s first-rate singing. How can I resist a bright yellow scoop of mango sorbet sprinkled with….I stopped as soon as I noticed suspicious chocolate balls adorning the bowl. The dish was whisked away (though it was a shame to waste and should have been left for others to enjoy), and a gluten-free, ball-less bowl was soon presented. 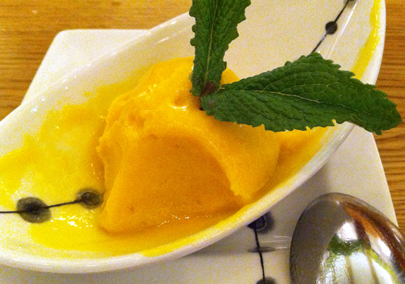 Though not the most original dessert, it was some of the best mango sorbet I have tasted—sweet, tangy and creamy beyond what I thought a mango was capable of. 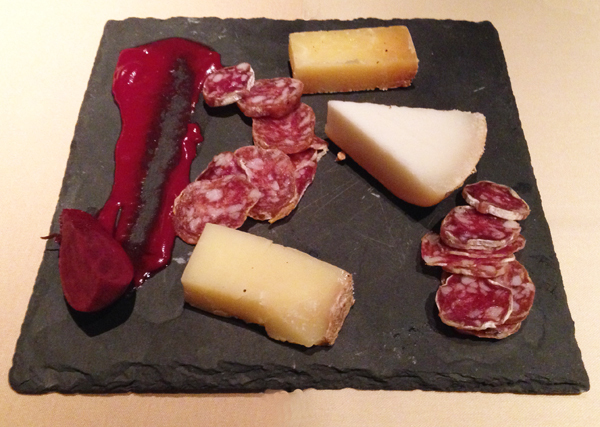 Overall, our experience was relaxing and delicious. 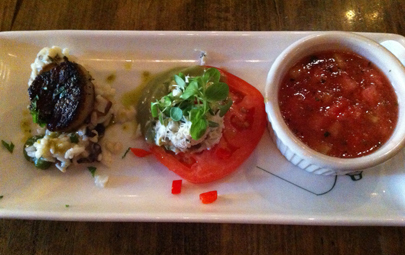 I have some scruples about slightly overpriced appetizers, such as the night’s special tomato salad, featuring a meager amount of heirlooms and not much else, priced at $12, and the absence of a veggie main dish on the menu. However, of all the Weidmaier enterprises I’ve tried, Wildwood is my favorite child. 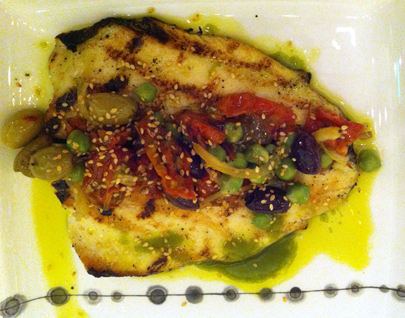 Categories: 4 Spoons, Dessert, Dinner, Gluten-Free, Maryland, Mediterranean, Seafood, Seasonal | Permalink. Growing up in New England, the fish market was a regular stop on our way home from school. Pungent aromas from cod or haddock often wafted through our kitchen, and italian seasoned bread crumbs were a staple in the cabinet. It was not until I moved to New York for college that I realized how spoiled my childhood had been. I now know that it costs a pretty penny to prepare the freshest seafood, and unfortunately my well trained, discriminating taste gravitates toward the freshest. BlackSalt Restaurant in the Palisades neighborhood of DC conjures fond memories of my younger years. I knew it was the perfect location to celebrate Ma Glutie Foodie’s birthday during Ma and Pa’s recent visit to DC. Owners Jeff and Barbara Black are dedicated to providing sustainable fish and seafood from around the world in all of the Black Restaurant Group locations. BlackSalt patrons enter through the fish market, passing by ice beds of shimmering fins and protruding heads. Sister Seitan averted her eyes and held her breath, and Mr. Green Bean scrunched his nose and gave me the “look”. But this night was about Ma and she was going to love it. 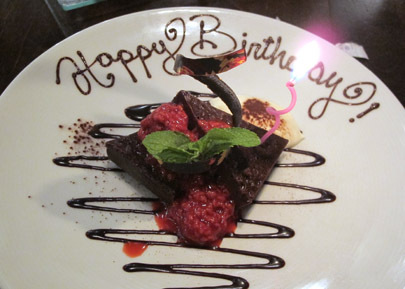 It was love at first sight as we were seated in the causal yet elegant dining room and opened our menus to reveal “Happy Birthday” typed across the night’s specials. We popped the prosecco and cozied into our kitchen-view table. Perfect for the mermaid in me, the menu is entirely seafood based, with the exception of one ribeye steak and a vegetarian option upon request. Market features change daily, and additional “just in” catches are announced as if the boat’s just out back. I knew we were in luck when our server mentioned crab cakes and Mr. Green Bean softened his “look”. As we reviewed the menu’s many extraordinary items with our server, he assured me that any dish that is not already gluten-free can be adapted. He also encouraged me to allow chef Thomas Leonard to prepare something special with my gluten allergy in mind. We started simple with a few table pleasers such as the BlackSalt Ceasar and the chef’s vegetarian appetizer for my gluten-eating family. (Note to all gluten-eating readers: the bread alone is apparently worth the visit. Even my sympathetic family couldn’t silence their exclamations). I lusted over the Atlantic Day Boat Scallops, the Panamonian Cobia Sashimi and the Wild Atlantic Black Sea Bass starters. 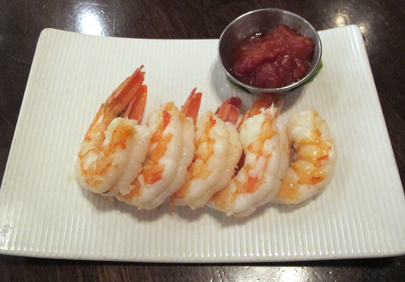 However, I settled on good ol’ shrimp cocktail, one of the only seafood dishes Mr. Green Bean and I can share. Though expectedly uninspired, the shrimps were cooked just right and the housemade cocktail sauce—with sweet and spicy chunks of fresh tomato—was good enough to eat with a spoon. For my main entree I gambled on a chef’s choice preparation of sea scallops. As the dish was placed before me and described by the restaurant manager, I grinned at my winnings. Four golden-top, pan seared scallops sat on a bed of julienned carrots and cabbage, sliced confit potato, white bean puree and a sprinkling of pesto. The carrot and cabbage saute was packed with garlic—a favorable ingredient that overstayed it’s welcome the next morning…and the morning after that. 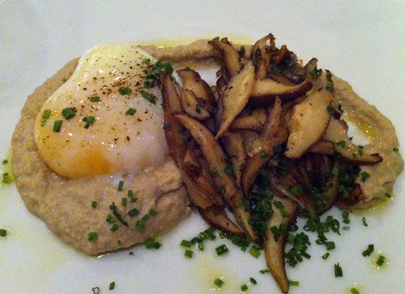 I would have appreciated more than the mere smear of white bean puree, and less of the potato that overwhelmed the dish. 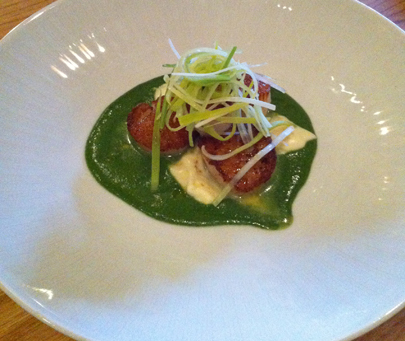 But the scallops themselves were sublime. 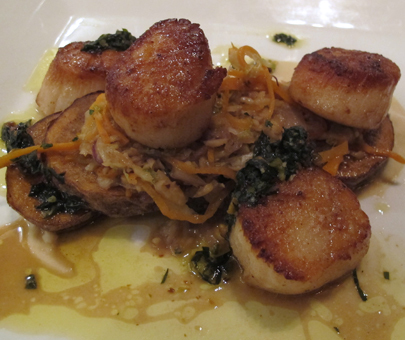 Pan Seared Scallops with sauteed carrots and cabbage, confit potato, white bean puree and pesto garnish. I reached my fork across the table to taste Pa Glutie Foodie’s gluten-free Virginia Rockfish with wild mushrooms, spinach, pearl onion jus and the same confit potato used in my dish. The skin-on filet was meaty and mild. The caramelized mushrooms and pearl onion jus made the dish with slightly sweet hints of maple flavor. 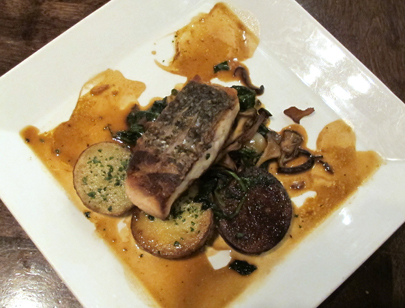 Virginia Rockfish with confit potato, wild mushroom, spinach and pearl onion jus. Mr. Green Bean described his two large pan fried crab cakes as “very good, not the best” (after years in Baltimore, this boy is a tough crab when it comes to his cakes). He seemed more excited about the accompanying sauteed green beans. We had a close call when the server initially assured me the crab cakes were 100% gluten-free. Knowing how unusual that would be, Mr. GB and I encouraged the waiter to double check with the chef. Lo and behold, “they just changed the recipe and they are actually not gluten-free”. Nice save. 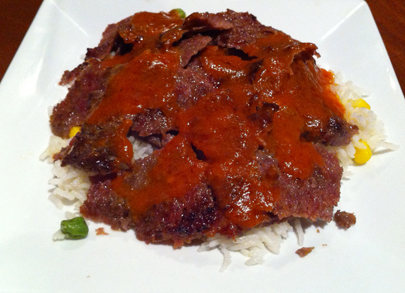 I treaded carefully after that and didn’t dare try Sister Seitan’s mystery veggie bowl. The abundance of greens and absence of any starch got to her mid-way through. She ordered a side of gnocchi and smiled as they arrived fried and crispy. Any misgivings about dinner were quickly forgotten with the first taste of dessert. The gluten-free Chocolate Chambord Truffle Cake was delivered with a candle and a chocolate drizzle reading “Happy Birthday”. Two triangles of heavenly, fudgey chocolate were balanced with tart raspberry compote and whipped cream. 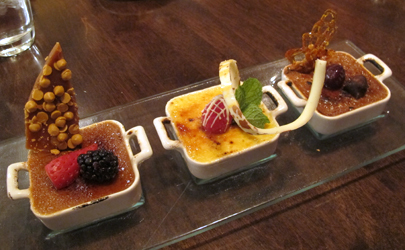 As if that wasn’t enough of a treat, the Trio of Creme Brulee included milk chocolate-hazelnut, white chocolate-raspberry, and butterscotch. 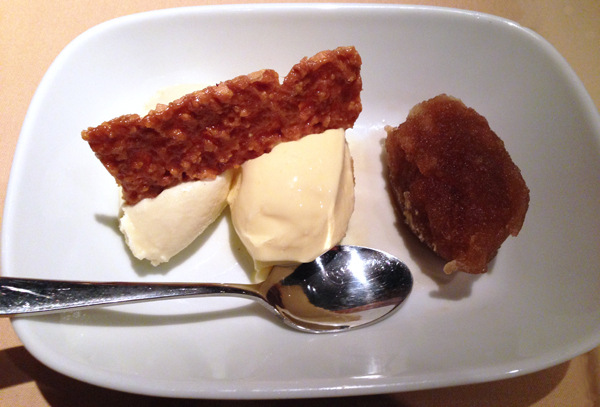 The chocolate-hazelnut’s mild sweetness and nutty profile stood out, but all three dishes were licked clean. Chocolate Chambord Truffle Cake with raspberry compote and whipped cream. Trio of Creme Brulee: butterscotch, white chocolate-raspberry, and milk chocolate-hazelnut. 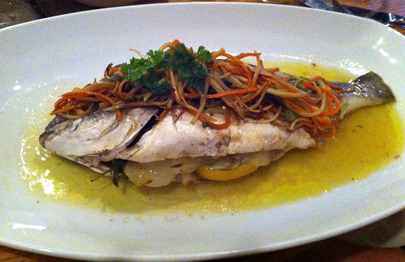 Overall BlackSalt Restaurant is a superior establishment in regards to it’s A+ service and availability of the widest variety of fresh catches in the District. I am reminded by our experience to always double check for gluten, even when the server’s confidence encourages my trust. I am also left to wonder how the menu’s pricey figures are determined. 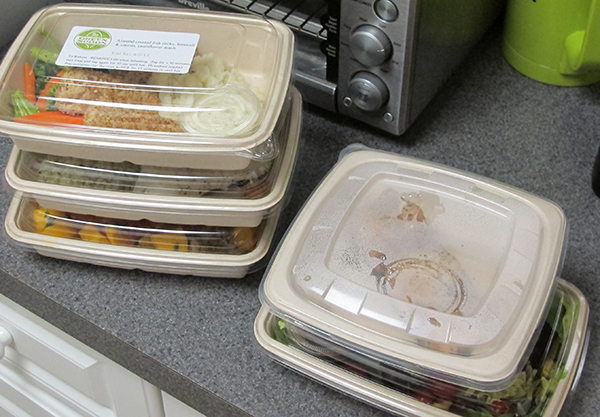 While I understand paying top dollar for seafood flown in from halfway around the world, $38 for crab cakes and green beans, and $30 for Sister Seitan’s heap of veggies seems excessive. 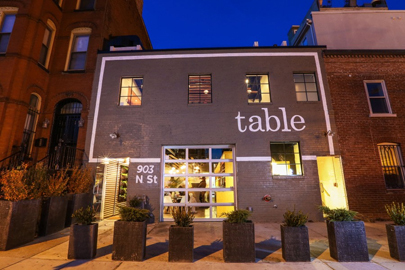 Categories: 4 Spoons, American, Dessert, Gluten-Free, Seafood, Seasonal, Sustainable, Uncategorized, Washington DC | Permalink.